Of all the parables used by Jesus in His teaching ministry, I do not believe there is one more important to properly understand than the parable of the wheat and tares found in Matthew thirteen (13). This parable gives us certain characteristics of the present time and age which we live in, as well as understandings of Christianity, Christendom, and the progress of the Christian dispensation. For the purpose of having some type of structured direction for this article, first we will speak of the details of the parable and its proper interpretation. But this does not touch on the overall prophetic importance the entire chapter has with its seven parables together, nor does it speak of the importance of the positioning of this parable among the seven in the chapter, and what implications are associated with this. If these key points are missed or ignored, it will only serve to rob us spiritually of the full understanding intended for us by the Spirit of God. Here then are the important spiritual understandings in the details of the parable and explanation given by Jesus. 1) The Son of Man is Jesus and He plants the wheat (Matt. 13:37). Jesus represents God and therefore He is doing God’s work. This work cannot fail. It is eternal and good. So this is seen in the planting of the wheat, the wheat coming up and being preserved its entire time in the field, and the wheat in the harvest time being taken out of the field and placed into the barn. As I said this is God’s work and He does so sovereignly, and so, nothing can stop it. Nothing can really harm the wheat. And the wheat can never become something else, because it comes from the good seed planted by God and under His securing care (Matt. 13:24, John 10:27-29). The wheat individually are true Christians, who are in Christ and sealed with the Holy Spirit (Rom. 8:1, 9, 15, 16, II Cor. 5:17, Gal. 3:26; 4:6; Eph. 1:3-7, 13). The wheat are the workmanship of God created in Christ Jesus (Eph. 2:10). 2) The enemy plants the tares (weeds). This enemy of the Son of Man is the wicked one, the devil and Satan (Matt. 13:25, 28, 38). The tares represent the work of the devil, and are the sons of the wicked one. In the overall composition of the crop in the field they are mixed together with the wheat. The work of Satan, because it is mixed together with God’s work, has spoiled and ruined the crop in the field. The tares grow up together with the wheat, and there is no separation one from another all the time the crop is growing in the field (Matt. 13:28-29). Only in the time of harvest at the end will there be a separation, and this by divine means (Matt. 13:39, 41). The tares never turn into wheat, nor can they, because they came from the seed planted by the enemy. The tares are those who have a false profession of Christ, and are not sealed by the Spirit of God, yet they are an integral part of the spoiled crop. 3) The field is the world. The crop may be in the field, but the crop is not to be confused with the field; the two are not the same. This is an important distinction to be made if we are to have a proper understanding of the parable. The world is made up of all those who do not profess Jesus Christ – these are all unbelieving Jews and Gentiles. The field really is not the subject of the parable, except that the Son of Man also owns the field and God will certainly judge the world someday by and through Jesus, the Son of Man (John 5:27, Acts 17:31). However, the parable isn’t really about the world or God judging the world. It is about good seed being planted, and in the same location bad seed was planted by an enemy. The mixture of wheat and tares creates the existence of a spoiled crop, not a spoiled field. The wheat are Christian believers. They are planted by the Son of Man. They are God’s work, the result of sovereign grace in redemption. They profess Jesus Christ as their Lord and Savior, and have been water baptized as a sign of being born of God. However, the tares are planted by the devil. They also profess Jesus Christ and have been water baptized – this is why they mix in so well with the wheat. As men, the tares are not unconverted sinners or common heathens. They are not unbelieving Jews. The tares profess to be Christians and have been water baptized as well. They were planted and they grow together with the wheat for the purpose of ruining the crop. The parable is about wheat and tares mixed together as a spoiled crop growing up in the field for the time of the age (Christian dispensation). At the end of the age during the time of harvest there will be another divine work in separating the crop, removing the wheat, and judging the tares. I do not believe the parable directly involves anything about God judging the world. 4) What is the spoiled crop in the field? Well, it isn’t Israel – they have been set aside by God, made desolate, hardened, burned and destroyed by God as the vineyard of God (Hosea 1:9, Matt. 23:38-39, Rom. 11:7, Isa. 5:1-7). They failed to receive Jesus as their Messiah and crucified Him, putting Him to death. Because of this God used the Romans to destroy Jerusalem and the temple in 70 AD. This physical act demonstrated the end of the Jewish dispensation and the end of the practice of their religion (Heb. 8:13). Many Jews were slain by the Roman swords and God scattered the remainder into the Gentile nations (Luke 21:20-24). This doesn’t sound like a crop growing up in the field. What then is the spoiled crop in the field? It is the entire corporate body of Christendom – all that has a profession of Jesus Christ, all which calls itself Christian. It has true profession and false profession. It has those who have been given the Spirit of God and those who do not have Him. It is good and bad mixed together (Matt. 13:47; 22:9-10); it is wise and foolish virgins looking alike and sleeping together (Matt. 25:1-2); it is faithful and wise servants mixed with evil servants (Matt. 24:45-51; 25:14-30); and it is a spoiled crop of wheat and tares mixed together in a field (Matt. 13:26). This is the present condition of Christendom in which all true believers exist in and are a part of, whether they want to be or not. Christendom is a spoiled and ruined crop growing up in the world. This is the simple testimony of God concerning it, and His testimony is always true. Whether innocently or willfully, the majority of true Christians are blind to this ruined condition, and our leaders will not admit to it. The result is that we go on participating in the midst of what God has judged as organized corruption, remaining involved in what God views as a form of godliness without any real power, instead of turning away from the evil (II Tim. 2:19-21; 3:1-5; 4:3-4). In the history of Christendom men have taken authority into their own hands and pulled up the wheat. Often the tares in ministry positions of their own making have severely persecuted the wheat. Evil servants have committed ecclesiastical abuse (beating fellow servants) and bringing in worldliness (eating and drinking with the drunkards – Matt. 24:48-49). Christendom’s record is filled with tares lusting after civil power, committing fornication with the kings and governments of the earth (Rev. 17:1-6). 6) The harvest at the end of the age is a period of time instead of one singular day. Although the wheat being gathered and removed from the field is the rapture of the true church (John 11:25-26; 14:1-3, I Thess. 4:13-18), and does happen in a moment of time (I Cor. 15:51-53), yet the bundling of the tares together and leaving them in the field (world) to be burned doesn’t necessarily happen instantaneously (Matt. 13:30, 40). The harvest is a period of time at the end of the present age, rather than a single day. The wheat are individual believers who are sons of God by faith in Jesus Christ (Gal. 3:26). They are those who are sealed by the Holy Spirit, who cries out in their hearts, “Abba, Father!” (Eph. 1:13, Rom. 8:15-16, Gal. 4:6) The destiny of the wheat is the barn. The wheat does not remain in the field, does not remain in the world. 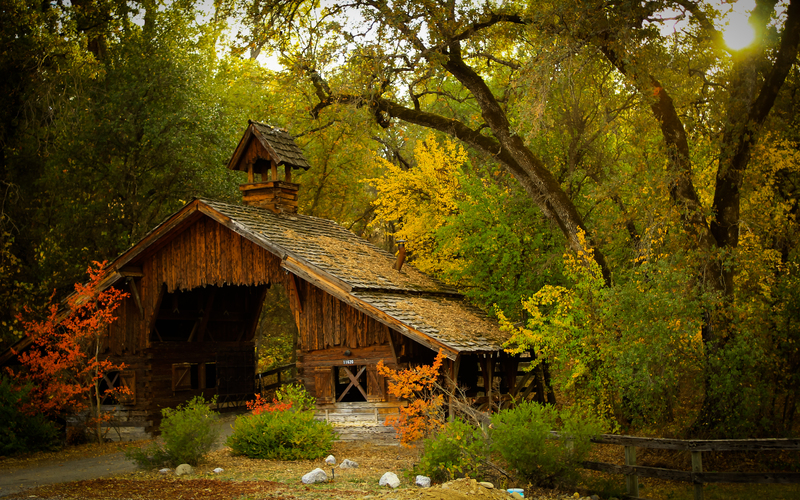 The barn is the Father’s house (John 14:1-3) and is located in heaven. The sons of God are the sons of the Father in heaven (Matt. 5:45). They have this established relationship with God, that of Father with sons. All the wheat have been given the same relationship which Jesus has with God (John 20:17). All the wheat individually are true Christians, and are members of the body of Christ, the church (I Cor. 12:12-14, Eph 1:22-23). Only the wheat in the spoiled crop of Christendom forms the church, the body of Christ. As a corporate body Christendom is not the same as the church. Christendom includes wheat and tares, while the church is only made of wheat. The church is built by Christ alone (Matt. 16:18). He planted the wheat on God’s behalf (Matt. 13:37). The destiny of the tares is judgement. Towards the end of this age the tares of Christendom will providentially be bundled together and left in the world. This seems to take place before the wheat is removed from the field – “First gather together the tares and bind them in bundles to burn them…” (Matt. 13:30) The parable only goes so far as to say the intention is that they will be burned. But the explanation goes farther. Explanations of parables and visions which are prophetic always go farther in what they reveal than the details of the parable or vision itself. The explanation has the tares being cast into a furnace of fire; there will be wailing and gnashing of teeth (Matt. 13:40-42). 7) The work done at the end of the age in the time of harvest is all divine work accomplished by angels under the direction of the Son of Man. Again, this is the sovereign work of God, whether it is the gathering of the wheat to remove the church from this world, or the bundling and judging of the tares in the world. The harvest is not under the responsibility of men, and not done by the hands of men. 8) The explanation also reveals more in that it distinguishes two kingdoms that will exist simultaneously after the end of the age and harvest. There will be the Son of Man’s kingdom on the earth (Matt. 13:41) and there will be the Father’s kingdom in the heavens (Matt. 13:43). Two kingdoms yet future; however, presently we are in the kingdom of heaven – the parable making this abundantly clear. This kingdom of heaven ceased to be “at hand” (Matt. 3:10; 4:17; 10:7), but came into existence when the Son of Man was rejected by this world and went back to heaven. At the present time this kingdom is very real and develops on the earth as a spoiled crop growing up in the field – Christendom in the world and on the earth. But the calling and destiny of the wheat is to the heavens. The church is a heavenly body which is in union with its Head in heaven, Jesus Christ, the glorified Son of Man (Eph. 1:22-23). The church is this Man’s body. Here then is another of the many mysteries of the kingdom of heaven given to believers to understand. In consequence of Jesus being rejected by the Jews as their Messiah and King, and the purpose of God contained therein (Acts 2:22-23), the Christian believer’s place and portion would not be in the Son of Man’s kingdom on the earth, but instead in the Father’s kingdom in the heavens – “Then the righteous will shine forth as the sun in the kingdom of their Father.” (Matt. 13:43) As is the character of all the mysteries of the kingdom of heaven (Matt. 13:11), so with this one. This is not Jewish thought. This is not found in Old Testament Jewish teachings. This is not hinted at by Old Testament prophecy. This is new revelation and a new order of things – a body being gathered on the earth by the Holy Spirit sent down; a heavenly body with a heavenly calling, destined to sit in heavenly places in Christ Jesus (Heb. 3:1, Eph. 2:6-7). No Jew would have ever conceived of such a thing. The mysteries of the kingdom of heaven are all unseen to the naked eye. They are always matters of faith – the substance of things hoped for, the evidence of things unseen (Heb. 11:1, II Cor. 4:18). Judaism is a walk by sight, demanding to see signs, a worldly sensual religion (I Cor. 1:22); it isn’t a religion designed to comprehend these mysteries (Matt. 13:11). The understanding of all the mysteries of the kingdom of heaven are given to the true Christian to comprehend. He has the potential to see the unseen with the eye of faith, to walk by faith (II Cor. 5:7). Only through true faith, seeing and walking by such, can the believer be pleasing to God (II Cor. 5:9, Heb. 11:6). This highlights some of the differences between the two religions – Judaism and Christianity. And in a similar way it marks out some of the dispensational differences that exist between the Jewish dispensation and the Christian dispensation. True Christianity encompasses and embraces the mysteries of the kingdom of heaven and teaches how one walks by faith in God; it teaches how the Christian is to walk as a pilgrim and stranger in the wilderness of this world (Heb. 11:13). The parable indicates that there is the providential power of God through the administration of the Son of Man by His angles which will bundle the tares together in the field to be burned. It is after this judgment is accomplished of the tares of Christendom, after they are burned in the world, that the righteous (the Christian believer) will shine forth as the sun. This shining forth in glory is not in the kingdom of the Son, not in the kingdom of the Son of Man, but in the kingdom of the Father. The short version is that we have the clearing of the world by this judicial process of the Son of Man sending out His angels. The righteous, those who had been righteous while the world was evil, shall be as the sun. Of course Jesus is “the Sun of righteousness” and “when He shall appear we will be like Him, for we will see Him as He is”; but this will be in the kingdom of the Father. What followed in the kingdom of the Son of Man on earth we aren’t told in the parable except that He gathered all that offended out of it, and that elsewhere in Scripture we are told that the earthly “kingdom of our Lord and His Christ was come.” But really the aim of the parable is the spoiled crop in the field until the end of the age as a similitude of the kingdom of heaven – the present form of the kingdom of God in this age – and how this mixed and ambiguous system is brought to its close. We must realize there exists a present form of the kingdom of God today in the world. That form is depicted by every parable in Matthew’s gospel which serves as a similitude of the kingdom of heaven. In no way does it correspond to the Old Testament version of a Messianic kingdom promised to Israel. That opportunity passed for Israel when they resoundingly rejected their Messiah when He was sent to them (John 1:11). The present form of the kingdom of God in the world today is whatever Christendom has become under the responsibility of men. But surely we can realize that Christendom is quite a different and distinct corporate body in profession, testimony, and character from that of the nation of Israel. One of the important points to be clearly understood from the parable is that the nation of Israel is not the spoiled crop growing up in the field. Consequent to their rejection of God’s Son, Israel was made desolate by God (Matt. 23:37-39, Luke 21:20-24, Matt. 22:7; 24:2). He set Israel aside and took the kingdom of God away from them (Matt. 21:33-44). Israel’s dispensation was ending at the time Jesus was speaking these parables. It is not possible to correctly describe Israel as a crop growing in a field. There happens to be a number of theological points which follow from this understanding. The crop in the world is Christendom. This is the present form of the kingdom of God in the world today. It is an error of spiritual ignorance to teach that the kingdom of God does not exist today. The kingdom of heaven was established when Jesus went away, back to heaven. This kingdom exists as it relates by profession of faith in a Lamb slain by the world, yet raised by God and exalted to the right hand of His power – rejected by this world, yet received in the heavens with glory and honor (Heb. 2:9). All power in heaven and earth has been given to Him in title after His resurrection (Matt. 28:18), but He sits at the right hand of God waiting until His enemies be made His footstool (Heb. 10:12-13). He has been given this power, but it isn’t the Father’s time yet for Jesus to rise up and use it. This sitting and waiting by Jesus Christ is one important characteristic of the present Christian dispensation; it characterizes the present mysteries of the kingdom of heaven – the form the kingdom of God takes in the world today, and the matters of faith associated with such a mysterious and ambiguous kingdom where the King is missing. Jesus is hidden now at the right hand of God (Col. 3:1-3). He has sat down on His Father’s throne (Rev. 3:21) and the Holy Spirit has been sent down to gather His body and bride, the church (John 7:39; 14:16-17, I Cor. 12:12-13). Only the true believer using the eye of faith can see Jesus sitting at God’s right hand (Col. 3:1-3), and that He is now crowned with glory and honor (Heb. 2:9). The world does not operate by faith in order to see what is unseen (II Cor. 4:18). Neither do the Jews (I Cor. 1:22). Neither do the tares of Christendom. If Jesus is hidden, it is to those who are not of faith in this world. Genuine faith characterizes the true Christian – he has the God-given ability and spiritual temperament to see with the eye of faith, to walk by faith (II Cor. 5:7), to understand what faith is and how it is actually defined (Heb. 11:1). The believer knows that without real faith he cannot please God at all (Heb. 11:6). All the teachings found in Matthew’s gospel concerning the kingdom of heaven, and all the parables in his gospel that are similitudes of the kingdom of heaven, give us the defining characteristics of the Christian dispensation until its termination by the harvest of Christendom at the end of this age. These teachings are Christianity as a religion, and often are presented in contrast to Judaism (Matt. 5:21-22; 5:27-28; 5:31-32; 5:33-37; 5:38-48). In truth, most of the Sermon on the Mount (Matt. 5; 6; 7) is Christian responsibility contrasted with Jewish responsibility. Therefore these teachings are for Christians as the Law of Moses was for the Jews. These teachings explain the believer’s practical responsibilities to be lived out as sons of their Father in heaven (Matt. 5:45, Gal. 3:16). The first sixteen verses of the Sermon in Matthew (Matt. 5:1-16) are the enunciation of the principles of the kingdom of heaven, the character and position of the true sons. Also these teachings of the kingdom of heaven are intimately connected with the Christian dispensation in that they define for us Christendom’s responsibility before God as a testimony and light to this dark world (Matt. 5:13-16). Matthew’s gospel must be seen as having two main purposes from the Spirit of God. When we speak of Messiah being sent and presented to Israel, this is certainly the first theme you encounter in Matthew’s writings. Messiah was to come to Israel according to Jewish promises and prophesies found spoken by the Lord through the Old Testament prophets (Matt. 1:22-23; 2:5-6, 15; 2:17-18, 23; 3:3). This we easily see. Also the first verse speaks of the physical lineage that would identify the Messiah when He came – Jesus Christ, the Son of David, the Son of Abraham (Matt. 1:1). This is the Messiah of Israel. As we have conclusively proven earlier in this article, the kingdom of heaven concerns the growth and development of Christendom in the world. As a likeness of the kingdom of heaven, the parable of the wheat and tares prophetically describes the history of the moral condition of Christendom during the entire time of the Christian dispensation. The phrase “the kingdom of heaven” is only used by the Spirit of God in Matthew’s gospel (33 times). It always refers to the teachings of Christianity, to Christendom as a corporate body in the world, and dispensationally to the Christian dispensation that would soon replace the Jewish one when Israel was set aside by God consequent to their rejection of their Messiah. Again, the understanding of how the Spirit of God uses this phrase is crucial. Therefore, the use of the phrase “the kingdom of heaven” never references Israel, the Jewish dispensation, or Jewish and Old Testament prophecies. The phrase never refers to a Messianic kingdom in Israel. Every time the phrase is used, the passage in which it is found then serves as an example of the core practical teachings of Christianity and this dispensational transition. Now returning to Matthew thirteen (13) and the parable of the wheat and tares, let us consider a few more doctrinal points. It is important to understand that the church is not the kingdom. Do not make this convenient theological mistake. The kingdom would be something outwardly visible. But can you see the body of Christ in the world? It is a naïve but serious doctrinal mistake if you think you can, and it is sad to see teachers assume they can and teach doctrinal implications based on such a mistake. We cannot physically see Jesus, the Head of the body, because He is in heaven. We cannot see the church as well; it is not visible in the world (Matt. 13:44). The kingdom however, has the visible and outward form of all Christendom combined together in the world, all that professes Christ. At this present time the form the kingdom of heaven takes is as much the work of the enemy and the failure of men as it is the work of God. But to say that the kingdom of God does not exist today is showing ignorance of God’s word and of the present mysteries of the kingdom of heaven God gave every Christian to understand. An overall consideration of the chapter (Matt. 13) shows it contains seven parables. Seven is a well-known prophetic number; not only does it mean seven as a group, but also it carries the prophetic meaning of completeness, wholeness, and perfection. Of the seven parables told by the Lord, the last six are similitudes of the Christian dispensation – likenesses of the “kingdom of heaven.” The short version is that this chapter gives us understanding of the complete picture of the Christian dispensation, from start to finish. The first parable is the Sower going out to sow and the Word of God as the seed. This is not a simile of the kingdom of heaven. Nevertheless it is related because it gives us the active agent in the work of God associated with the kingdom (Matt. 13:19) – in the explanation of this parable Jesus says, “When anyone hears the word of the kingdom…” I also think it’s important to realize that Jesus is the Sower. We shouldn’t fancy that we are the sowers. The planting of the seed is the work of God and if the seed falls into good soil it is because God has prepared it beforehand. There really isn’t any Arminian thoughts involved here. Also it is good to realize that this parable describes something new – God having a new planting in the world different than the old vine He brought out of Egypt, of which He never received any good fruit (Isa. 5:1-7). The following six parables are similitudes of the kingdom of heaven, but there is a marked difference in them and how they are properly divided. Note that the explanation of the wheat and tares and the last three parables are spoken in private to the disciples after the crowds had been dismissed (Matt. 13:36). One reason for this private teaching points directly to verse eleven in the chapter (Matt. 13:11) – it was the sovereign choice and grace of God to give understanding of the mysteries of the kingdom of heaven to His disciples only, instead of giving it to the Jews. A second reason is that this private session for His disciples, and specifically the content of the instruction given in this discussion, reveals the mind and counsels of God to them from a divine perspective. This spiritual understanding wasn’t ever intended for the crowds – the multitude of the Jews. What was spoken in general to the crowds was the Sower and the seed parable with its explanation, and then the first three parables of the following six prophetic ones. The content of this teaching is fairly simplistic, showing what may be outwardly observed by all men concerning the establishment and development of the kingdom of heaven in the world. They show the outward form and external results of the kingdom in the world, which could be understood by most anyone with a minimal amount of human discernment. As this portion was spoken to the multitudes, certain parts of its content could be understood by the world. However I do not believe the world understands everything that Jesus spoke to them (Matt. 13:11, 13, 14). The believer should notice that in all which was spoken to the multitudes (Matt. 13:3-35) there is not only the work of God, but also the work of Satan, and the definite mixture of evil and good in the kingdom. The world can see Christendom in general as a corporate entity in the world, can see its growth and development, its power and influence through its history, and would think that this is generally a good thing. I do not doubt that God has blessed the world tremendously through the hardening of Israel and the beginning and spread of Christendom in the world – scripture makes this point clear (Rom. 11:7-15). But God expects the believer to spiritually see and perceive far more than the unbeliever can. With the eye of faith the true Christian can see that men were sleeping, allowing the enemy to come in and do his work in spoiling the crop. We have the ability to perceive that all kinds of birds find their habitation in the confines of Christendom, and that false teachings have saturated the whole measured form (Matt. 13:31-33). We can understand that Christendom is corrupt and spoiled, and that these are just some of the reasons why the Christian dispensation will fail and come to an end. The Gentiles (Christendom) have not continued in the goodness of God; they will soon be cut off and the dispensation will end (Rom. 11:19-22). So we have in what was taught to the multitudes that which could be outwardly observed by the world, and the general impression of its blessing and greatness in their sight as to what man has brought forth and accomplished in the kingdom. But through the eye of faith the believer may see all the evil brought in, in its many different forms, to corrupt and ruin the crop in the field, and to know the Christian dispensation has failed in the responsibility of men, and that this dispensation will end in the judgment of Christendom by God (Matt. 13:30, 40, 41, 42). We may pause here and ask ourselves, “What does the world see?” They see Christendom as all who call themselves Christians. They see Christendom as being led by Rome, and the pope as being the unequivocal leader of Christianity. The world regards the Roman Catholic church as the mother church, the original church, and the true one that speaks for and represents God in the world. Their view of Protestantism is, more or less, of a neat little rebellion that couldn’t hold itself together, but has splintered into a smorgasbord of belief systems, no denomination any better than the other, but certainly a variety of choices promising to suit and comfort the most particular of self-seeking enthusiasts. The world most likely thinks that the mother Catholic church will eventually re-gather in the factions which she lost long ago. The instruction given in private to the disciples (Matt. 13:36-52) reveals to the believer the mind of God in His counsels for the kingdom of heaven – this is the all-important explanation of the wheat and tares parable (Matt. 13:36-43). Also, in the two short parables that follow we are given God’s viewpoint and perspective as to what is of greatest value to Him in the kingdom of heaven, and what intrinsic character that object holds in His sight. This object of God’s delight is the body of Christ, the true church. She is such a great treasure to the Son of Man that He goes and sells all He has in order to purchase a field and hide it therein (Matt. 13:44). This shows the value the church holds in God’s estimation, as well as God’s willingness to allow the church to be hidden from sight in the world for the time of the present dispensation. Also the church is the pearl of great price for which the Son of Man sells all He has in order to purchase it and possess it (Matt. 13:45-46). The pearl represents the intrinsic moral character the church has to God in His counsels (please see Eph. 5:25-27). Finally in this portion we are given the results in God’s hands at the end of the Christian dispensation (Matt. 13:47-50). The first two verses is the parable, the following two verses the explanation. The dragnet contains all the good and bad which Christendom has gathered by the gospel (the net) out of the world (the sea). It is God’s work to separate and judge Christendom at the end of the age. It is not the world that is being judged here, because in this parable the sea is the world and the net of Christendom did not gather everything that was in the sea. The two different sections of instruction with their differing viewpoints is a style of contrast found in other passages of scripture. In Daniel king Nebuchadnezzar has a dream of a beautiful and majestic image of gold, silver, bronze, and iron (Dan. 2:31-32). This is man’s viewpoint or the world’s viewpoint of Gentile civil power, the four empires in all their glory that would rise up and rule the world in succession. But later in Daniel the prophet has a vision where we are given God’s viewpoint and perspective of the same world powers (Dan. 7:1-7). God sees them as animals, unruly in character and showing no obedience to the will of God. We could also look at the message to the last of the seven churches in Revelation three (Rev. 3:14-18) – Christendom has a viewpoint of itself quite different than the opinion God has of it. The two parables, the wheat and tares, and the dragnet, show a greater dispensational character and pattern than the other parables in the chapter. Both do a good job in identifying the corporate body (Christendom) given responsibility by God during the Christian dispensation. Seeing and identifying this dispensational pattern allows us to make and clarify some broad conclusions. The corporate body under the eye of God, where He is looking for obedience in testimony representing Him in the world, is Christendom. She is the spoiled crop in the field and she is the net in the sea which indiscriminately gathers things of all kinds. The dispensational responsibility is not with Israel – their dispensation ended, and this new dispensation, the kingdom of heaven, the Christian dispensation, succeeded it. The dispensational responsibility is not with the true church, the body of Christ. Of course the church is contained in the crop, in the dragnet, but she is only a part of this large external body, and I dare say not even close to being a majority. The two parables show how the dispensation ends in judgment from God. This is part of the dispensational pattern. We easily see in scripture how the Christian dispensation is predicted by God to follow the same course of failure as the Jewish dispensation, resulting in God’s judgment. The harvest time at the end of the age is the separation and judgment of Christendom (Matt. 13:30); the net being dragged to the shore depicts the same harvest time of Christendom at the end of the age (Matt. 13:48). In the first of these two parables the field is the world; in the second the sea is the world. The judgement of the world by God is not the subject of either parable, nor is it found prophetically anywhere in the entire chapter. At the end of the age it is Christendom that is separated and judged, and this in turn ends the Christian dispensation. If we want to see God’s judgment of the world we need to read the fourth through nineteenth chapters of the Revelation – there we have the world’s judgment, including that of unbelieving Israel. Israel is always considered by God as part of this world. That is why the Jews will be judged along with the world, notwithstanding God will seal and preserve a Jewish remnant (Rev. 7:1-8). Israel has an earthly calling from God. They were promised the land as an inheritance and will be restored there according to all Jewish prophecies. Judaism, although given by God, was an earthly and worldly religion; it was a walk by sight, the performing of fleshly ordinances, and the repeating of animal sacrifices (Heb. 9:1-10; 10:1-4). The law was void of any ability to give life or righteousness (Gal. 3:21). But the Christian believer has a heavenly calling (Heb. 3:1). And all true believers are made members of the body of Christ by the baptism of the Spirit (I Cor. 12:12-13). The body, the church, is in union with its Head, who is Jesus Christ, the glorified Man, in heaven and at the right hand of God (Eph. 1:22-23, Col. 1:18). Truly, beyond any doubt, the true church is a heavenly body destined to sit in heavenly places and to be blessed with spiritual blessings from God (Eph. 2:6-7; 1:3-6). Because the church is a heavenly body it can never truly be defined by an earthly dispensation. There is no counting of time in heaven or with heavenly things. But Israel has an earthly calling, and they had the Jewish dispensation, and the counting of time prophetically is intimately associated with God’s dealings with them (Dan. 9:24-27, Rev. 11:3; 12:6). But the present Christian dispensation is where the whole of Christendom by profession has responsibility for the testimony of God to the heavenly glory given to Christ. It is not the dispensation of the church; it wouldn’t be proper to call the present dispensation by that label. It is properly the Christian dispensation or the dispensation of the kingdom of heaven. The corruption and evil of Christendom will be judged on the earth after the true church is removed from the world.